August 4, 2014 – Cedar City, a Larry H. Miller Tour of Utah host locale, put on its first USA Cycling sanctioned elite women’s race, the Zappos.com Cedar City Grand Prix, and the world watched a fine selection of top women cyclists fight for the win over sixty minutes of heated racing in southern Utah. 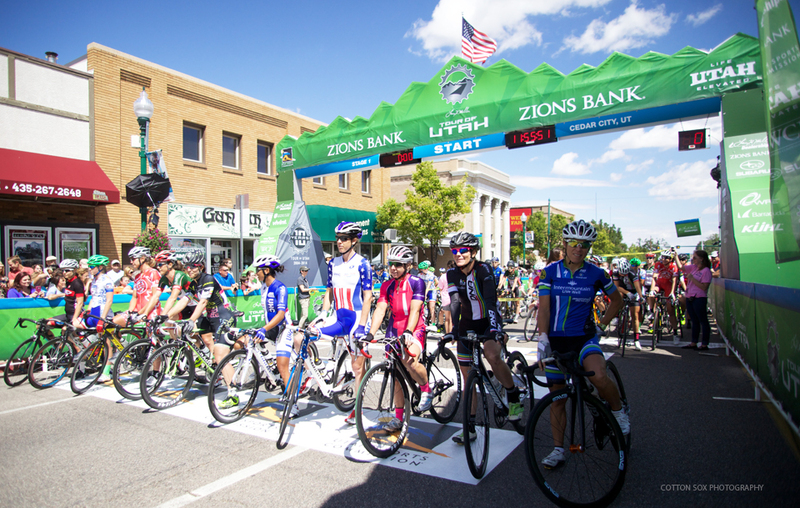 Triple national champion Alison Powers (UnitedHealthcare Pro Cycling Team), long-time icons of the sport Tina Pic (DNA Cycling p/b K4) and Laura Van Gilder (Guru), and other national standouts lined up on Main Street alongside Utah’s best elite riders. Utah favorites included Tiffany Pezzulo, Laura Howat, Mindy McCutcheon, Kaytie Scott, Anne Perry, Tina Pic, Breanne Nalder, Jennifer Vollmer, Amber Brown, and Rachel Cieslewicz. A new women’s event means so much to all of the athletes, but this one held special value for the local ladies who usually have to travel a good distance to compete with the country’s best. Ogden’s Jennifer Vollmer (Livewell p/b Bountiful Bicycles), for example, normally wouldn’t race with a broken wrist. But she did today, even though she probably knew she would have to pull out before the finish. “I did it because it’s the Tour of Utah, and it’s the inaugural (Cedar City Grand Prix) and I don’t know if I’ll ever get this chance again,” Vollmer said. “It’s pretty spectacular to be a part of it. So I had to get in and do it. “It’s awfully exciting for women to have the chance to race at this level. A lot of us work full-time jobs, have kids, have to manage everything and to be able to come down and throw down and race hard with amazing people like Alison Powers and Coryn Rivera, it’s incredibly exciting.” Vollmer, mother of three, currently works as a newspaper editor for an Air Force base in Arizona. She had to pull out after 25 minutes. Vollmer’s teammate Kaytie Scott, is a respiratory therapist. She’s also from Ogden and made a move to get away early on in the race. So did Vanderkitten’s Amy Charity. Colavita-Fine Cooking, Jet Cycling, Guru, Pepper Palace, and other teams tried to send riders up the road, but the pack kept a tight rein on every breakaway attempt. Each rider who tried to slip away was quickly reabsorbed. UnitedHealthcare had arrived with their young sprint superstar Coryn Rivera who just earned the best young rider distinction at La Course by Le Tour de France with her sixth place result. The team had planned to make the day hers and found their way around to the front. But Rivera had disappeared and would finish minutes behind the winner, her teammate Powers. At that point Powers knew it was her game to win or lose. Pic and Team TIBCO / To the Top’s Samantha Schneider had launched their sprints into the uphill finish and headwind as well, and at the line the three women finished within inches of each other, with Schneider second and Pic third. The Cedar City Grand Prix also awarded sprint competition and most aggressive team prizes. Colavita-Fine Cooking’s Olivia Dillon won the sprint award. UnitedHealthcare came away with the team classification. Cedar City’s race is one of two new women’s races this week. The Tour of Utah is launching a women’s edition on August 6 at the Miller Motorsports Park. Wangsgard called Powers months ago to ask what it would take to have the UnitedHealthcare team in the Cedar City race. Powers assured her they’d be there. Utah riders fared well with Tina Pic in third, Tiffany Pezzulo in 7th, Mindy McCutcheon in 18th, Laura Howat in 25th, Kaytie Scott in 28th, and Anne Perry in 31st.